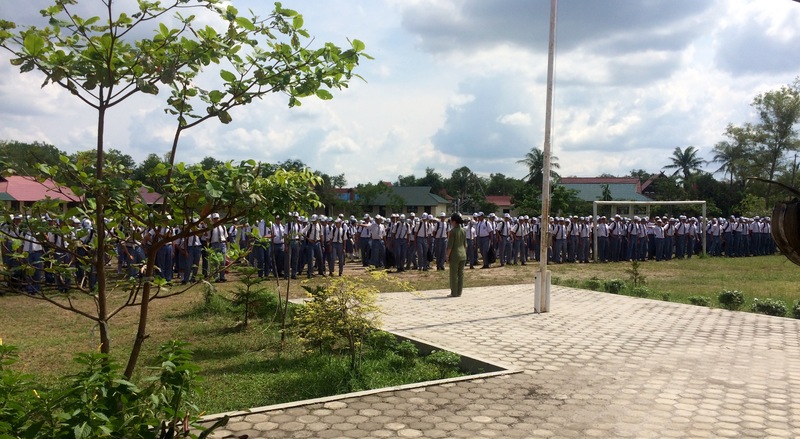 Welcome to SMAN 5 Palangkaraya – a military-style, boarding high school on the outskirts of a remote jungle city. My Fulbright ETA year has been a wild ride with an environmental disaster prompting multiple evacuations to the unique experience of teaching and living at a military school. Welcome to SMAN 5 Palangkaraya. 3:38am – chanting and stomping. Hundreds of students run in a circle outside my house and spiritedly sing the school song. This used to make me laugh really hard when I woke up to this every Tuesday and Thursday morning, but now I just pray that it rains so they don’t run and I can sleep peacefully. However, this has led to more 3:45am Snapchat videos than I have ever taken in my life. Six months into boarding school life, they definitely still wake me up but I’ve gotten a lot better about falling back asleep despite their chanting. 5:45am – chanting again. This time as they line up for breakfast and march into the dining hall. I wake up, and promptly roll over and fall back to sleep. Marching to school after breakfast — also note the shaved heads for the boys and the short hair on the girls. They all look identical and I had a hard time learning their names but I’ve gotten a lot better at it. 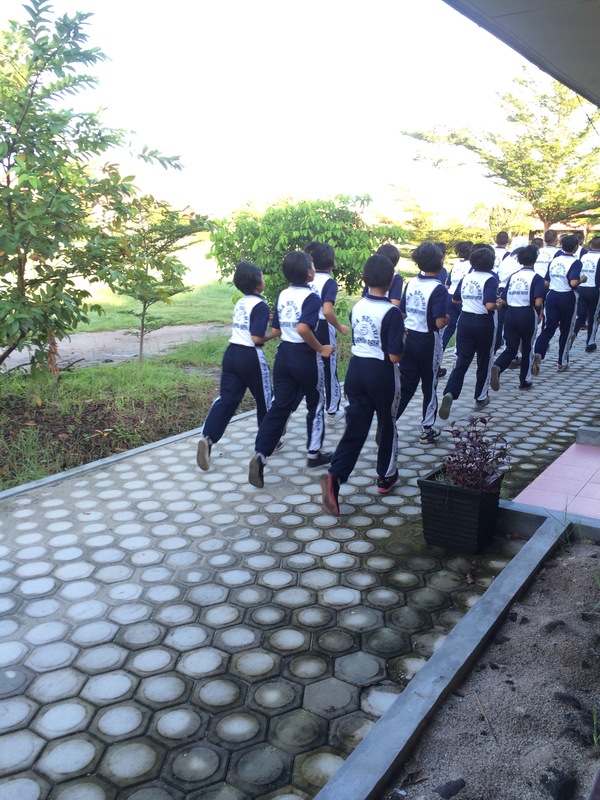 Around 10:15am I walk the short distance through the asrama (dormitory) to the school. I call “selamat siang” to the security guard, “good morning” to the 10th grade students sweeping outside their classrooms, and wave merrily to the students across the field who are desperately trying to get my attention. I teach two classes on Tuesdays, both 10th grade. While I haven’t had the privilege of attending any classes in my fellow ETAs’ schools, I know from their stories that military school makes my children seem like angels. If they aren’t in class by the time I walk in, I can lecture them once and it will never happen again. When I call for quiet, they get quiet. There’s no guitar playing, no side conversations, no disturbances (except for the one time a student had a 2 day-old kitten hidden in her desk) – and I’m thankful to military discipline for that. The class periods are not nearly as regimented as I would like for military school. Classes are theoretically 90 minutes long, but who knows when the bell will ring to end class – it could ring 20 minutes into class and there goes your perfectly crafted 90-minute lesson plan… This happened to me twice last week. On this particular Tuesday, I start class, as usual, with a game, because after waking up at 3am my kids are pretty sleepy by 10am. If I can make them get out of their seats or make the game competitive, I know I can wake them up so they’ll be good to go for the rest of my class. Today we’re learning about recount texts and after the game, I pass out handouts with a short story of my own that I thought they would enjoy – titled Bule Falls in the Latrine. Their laughter when they receive their handout is better than any game I could have started the class with. 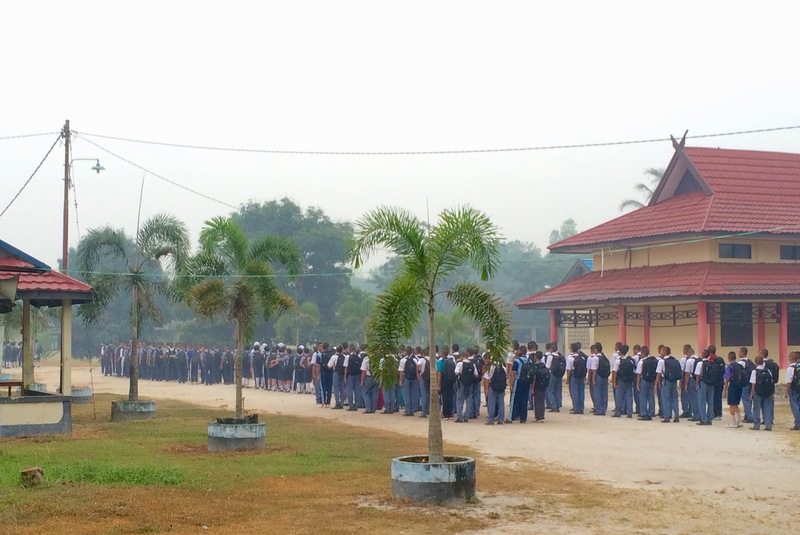 1:30pm – After classes finish, the students march to the front of the school and line up in their rows, class by class. I walk back to the teachers’ lounge and usually watch the “announcement ceremony” until it’s finished and then follow the students as they march home. During these ceremonies, there are usually a number of announcements from the teachers, and a lot of chanting and saluting. However, occasionally there are punishments. Today, it is the 10th grade. The other classes are dismissed, while two or three classes of the 10th graders remain on the field. They all begin to stack their backpacks on the side and then the boys drop to the ground and start hammering out pushups. The girls go to one side and begin doing squats (in skirts! no thank you). This is military school-style punishment. As I walk home behind the other classes, I chuckle, sneak a few pictures. I have to awkwardly pass right next to the students and I give them a sympathetic smile and receive a cheery wave in return. These kids are awesome. Everything is done military-style. Even jogging during PE is done in perfect lines. The afternoon is filled with chores. Students (particularly the 10th grade) do everything from refilling water gallons to sweeping the dirt. Here at military school we have a very strict hierarchy (much to my dismay), and the 10th grade students are made to do every menial task – and also live in fear of the 11th and 12th grade students. The older students can enforce punishments on the younger ones – they can make them do pushups, squats, run, stand in a corner… What I dislike the most, is the deference that the 10th graders must give the 11th and 12th graders. If I have 10th graders at my house studying with me or preparing for the WORDS competition, and 11th grade students come over, then (despite my protests) the 10th grade students will automatically leave and let the older students work with me. I find this ridiculous and wish that my house was a neutral zone where anyone felt comfortable working with anyone else inside… but in the six months that I’ve been here… I haven’t managed to break that hierarchy. 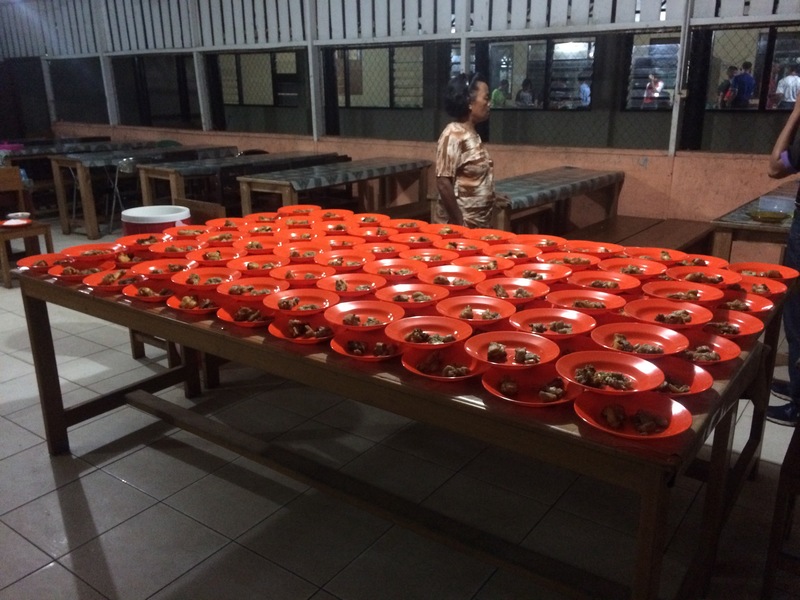 5:50pm – Dinnertime is it’s own affair at SMA 5. At 5:30pm or so, the 10th grade boys start lining up outside their dormitory. They begin chanting at 5:40pm when the 11th grade boys begin to line up as well. (The 12th grade can do whatever they want – it’s all about the hierarchy). My front porch looks right at the area where the boys congregate, while the girls’ dormitory is on the other side of my house, but they are doing the same routine. At 5:50pm they begin chanting and marching into the dining hall and I know it’s my cue to come as well. I run back into my kitchen, grab my fork and spoon, and head around the swamp. The boys are marching towards the dining hall and when they get there, they stop, re-situate their lines, do some more chanting and do a fancy little military turn. It cracks me up every time. They head down the short hall, with me behind them, and each one grabs a plate from the kitchen with a tiny piece of chicken on it and goes back to one of the three dining rooms. One is for the 10th grade, and the other two are for the 11th and 12th grades. I make my way back to RM1 (ruang makan satu = dining room one), scoop some rice onto my plate and join one of the tables of girls. Of course, the room is divided with boys occupying the tables to the right, and girls the left. We sit, turn to face the doorway and wait for the student leader to take his or her position. This student steps in front of the doorway and calls, “SIAP. BERDOA.” And all heads bow in prayer. After about ten seconds, the students calls “BERDOA SELESAI. MAKANAN MULAI.” The students stomp their feet and then we altogether call, “SELAMAT MAKAN!” Now, we are allowed to begin eating. But it’s rushed. We shovel food into our mouths in the general quiet (except for my table, where I always break the rules and make my table talk to me ~ teacher privileges) and about seven minutes after we began eating, the student leader makes a quick sweep of the tables and returns to their position. All forks and spoons are set down immediately and our backs are straight and upright in our chairs. The student leader calls “MAKANAN SELESAI. BERDOA MULAI.” and we pray again. After another call from the leader, we all chant, “TERIMA KASIH!” Table by table, we get up, scoop the remaining food off our plate, stack the plates and cups in a large garbage bin, and wash our own spoons and forks in a bucket of soapy water. The students then march out of the dining hall and reform their lines, and after a few more chants and fancy turns, they march back to the dorm while I saunter behind them. 9:00pm – Several times a week we have yet another “ceremony.” Sometimes it is separated by gender, and sometimes the whole school gathers together. Often, this takes place about 20 yards from my house, and it is an hour of chanting, singing, marching, and stomping. However, occasionally, it has happened literally at my doorstep – the dorm leader (a military soldier from the nearby base) lives in the house across from mine – and the students will all congregate between our two houses. This is not my preferred location as it feels like all 350 students are about to storm my house. 10:00pm – By ten o’clock the asrama is usually quiet. Unless of course, they are practicing for a scout competition and there are then 20 students chanting, singing, and playing instruments 20 yards from my house until midnight. 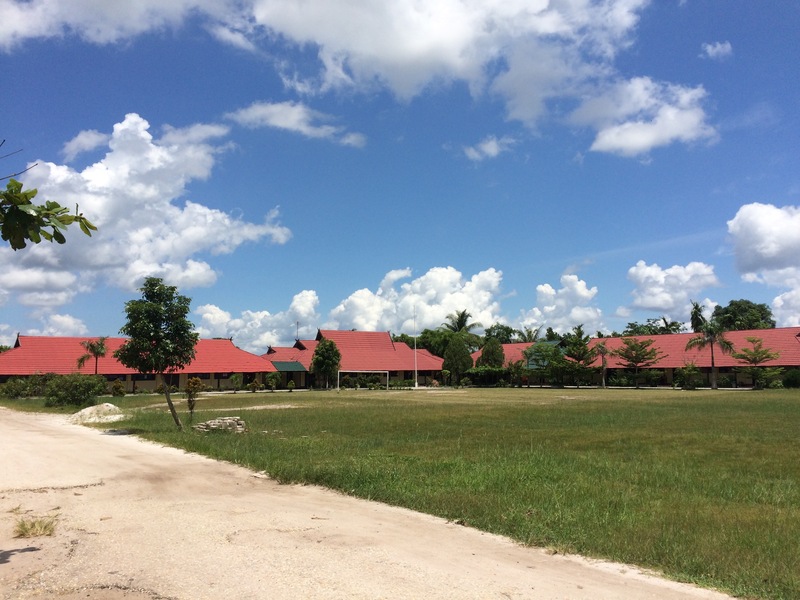 But it’s the constant sound of students… of laughter, singing, and chanting… that will be some of my most vivid memories from Palangkaraya. I am with my students 24/7 and while at times, it is exhausting, I wouldn’t want it any other way. Mackenzie Findlay is a Fulbright English Teaching Assistant placed in Palangkaraya, Central Kalimantan at SMAN 5. She graduated from Washington University in St. Louis in 2015 with a double major in International Development and Women, Gender, & Sexuality Studies. She enjoys connecting with her students over social media, tasting every new food in Indonesia that she can find, and working her way through her book list – thank god for Kindles! You can follow her blog at http://www.neverskipdessertblog.com/. Thanks for sharing Mackenzie. A day in the life is a bit different for each of the ETA’s, and I am happy to read that each of you are having an amazing experience.